Cambridge Analytica, a company that profiled voters for Donald Trump’s campaign, allegedly harvested private information from more than 50 million Facebook profiles, which they used to influence and wage a "culture war" during the 2016 election. Whistleblower Christopher Wylie, who helped found Cambridge Analytica and served as their director of research until 2014, told NBC News' U.K. partner ITN Channel 4 News that the company helped develop an application on Facebook that paid individuals to take a survey. If users had not adjusted their privacy settings on the social media outlet, however, the app didn’t just capture the survey responses — it also gathered as much data from each account as possible. That data included information from Facebook users’ friends and contacts, as well. "So by you filling out my survey I capture 300 records on average right," Wylie told ITN Channel 4 News. "And so that means that, all of a sudden, I only need to engage 50,000, 70,000, 100,000 people to get a really big data set really quickly, and it’s scaled really quickly. We were able to get upwards of 50 million plus Facebook records in the span of a couple of months." Similar stories based on the same reporting also appeared in the New York Times and the Observer of London. According to Wylie, the project was of particular importance to Steve Bannon, who later served as the chief executive of Trump's campaign. He added that the former head of the right-wing media organization Breitbart wanted to use the data netted by Cambridge Analytica to influence and galvanize the views of the American public. "Steve wanted weapons for his culture war, that’s what he wanted," Wylie said. "We offered him a way to accomplish what he wanted to do, which was change the culture of America," Wylie added. A Cambridge Analytica spokesman refuted all of Wylie's claims, calling his decision to speak to the media "a malicious attempt to hurt the company." "We were forced to take action against Mr. Christopher Wylie to prevent his misuse of the company's intellectual property and he is the subject of restraining undertakings in this regard," the spokesman said. "It is clear that he has a grudge to bear and appears set on trying to damage the company." But Wylie said in the initial interview that this wasn’t about getting back at Cambridge Analytica, noting that "if it was about revenge I could have done this years ago." Instead, Cambridge Analytica’s former director of research calls his whistleblowing a crisis of conscience. "It weighs on me that I played a pivotal role in setting up a company that I think has done a lot of harm to the democratic process in a lot of countries," Wylie said. The idea behind the project was that political preferences can be predicted by personal details people voluntarily provide on their social media accounts. 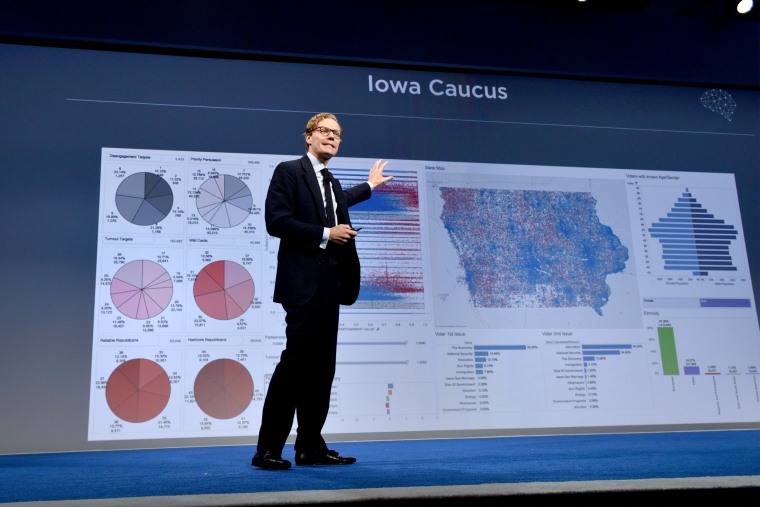 By analyzing the details that users share online, Cambridge Analytica could predict individual behavior, which included voter preferences and how to influence that preference. "Whenever you go and you like something you are giving me a clue as to who you are as a person," Wylie said. "And so all of this can be captured very easily and run through an algorithm that learns who you are." Wylie said that "almost none" of the people whose profiles were tapped were aware that Cambridge Analytica had harvested their data. The research all began in 2013 at Cambridge University, according to ITN Channel 4 News, where the university's psychometrics center began to examine the psychology behind Facebook and what information could be gleaned by pulling the data from user profiles. According to Wylie, Bannon hoped to use that research and replicate it on a massive scale across the American electorate to buoy his influence campaign in 2014 and again in the 2016 presidential campaign. Billionaire Republican donors Robert Mercer and his daughter Rebecca — who own a portion of Cambridge Analytica — put Bannon in contact with the founder of the method, Cambridge University academic Aleksandr Kogan, ITN Channel 4 News. "Kogan didn’t make any money off of it, he didn't," Wylie said. "He did it for free, and what he got out of it was the giant data set and what [Cambridge Analytica] got out of it was also data, everyone got data. But Cambridge Analytica paid for it directly." Cambridge Analytica appeared to lay the blame on Kogan and his company Global Science Research (GSR), which is not associated with Cambridge University. "This company, Global Science Research (GSR), was contractually committed by us to only obtain data in accordance with the UK Data Protection Act and to seek the informed consent of each respondent," Cambridge Analytica said in a statement issued Saturday. "When it subsequently became clear that the data had not been obtained by GSR in line with Facebook’s terms of service, Cambridge Analytica deleted all data received from GSR," the statement added. According to ITN Channel 4 News, Kogan said he held the right to use the data for commercial purposes and did nothing wrong. Meanwhile, the Trump campaign paid Cambridge Analytica $5 million to help target voters. The company told NBC News mere days before the 2016 election that it held data on 230 million American adults with approximately 4,000 “data points” on each of them. The company denied, however, using any data that was harvested from Facebook via Kogan’s methods to help the Trump campaign. "No data from GSR was used by Cambridge Analytica as part of the services it provided to the Donald Trump 2016 presidential campaign," the company added in Saturday's statement. Facebook said in a statement that "Protecting people’s information is at the heart of everything we do, and we require the same from people who operate apps on Facebook." The social media provider added that Cambridge Analytica, Wylie and Kogan had told the company that all the data initially obtained by the app had been destroyed. "In light of new reports that the data was not destroyed, we are suspending these three parties from Facebook, pending further information," Facebook said. "We will take whatever steps are required to see that the data in question is deleted once and for all — and take action against all offending parties." The social media company also insists that this did not constitute a data breach, as users technically consented — via their privacy settings — to allow Cambridge Analytica to harvest their data. But Wylie does not think Facebook is completely innocent, as the social media giant first knew of the data gathering in 2015. "Why Facebook didn't, you know, make more enquiries when they started seeing that, you know, tens of millions of records were being pulled this way? I don’t know you’d have to ask Facebook that," Wylie said. "But Facebook at least in a technical sense facilitated the project because they had applications that had these permissions in the first place." According to Wylie, Facebook never checked that they had deleted the data, only requiring that Cambridge Analytica fill out a form. And thanks to the lack of oversight, this influence-peddling company was able to "move into the hearts and minds of American voters in a way that had never been done before." And they did it in a way that entered a more than ethical grey area, according to Wylie, who claims they attempted to manipulate voters by latching onto their vulnerabilities. "This gets at the heart of, you know, why is it that you’re taking this psychological approach?" he said. "Why is it that you need to study things like shame proneness in people? Why do you need to, you know, study neuroticism in people? What’s going to make them fearful?" CORRECTION (March 17, 2018, 7:50 p.m.): An earlier version of this article misstated the position Steve Bannon held in the Trump campaign. He was the chief executive, not the campaign chair.